Glass Railings are HOT! 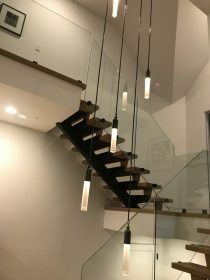 Architects and homeowners love the open feel, clean lines, and modern décor that is inherent to glass railing systems. 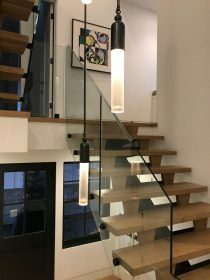 With the aesthetic benefits glass railing provide, they can be a liability from a safety stand point if the proper hardware and glass is not considered. For decades monolithic tempered glass was the “go to glass” for these installations. Here in, lies the main safety liability. Monolithic tempered glass can break (from an impact or due to something called spontaneous breakage stemming from an imperfection in the original manufacturing of the glass) and when monolithic tempered glass breaks, it breaks into hundreds, if not thousands of small pieces of glass; anyone leaning against a glass railing or walking underneath a glass railing can be severely injured. Click here to read a quick article discussing the above stated issue that occurred at the W hotel in Austin TX. The 2015 IBC, International Building Code, states that monolithic tempered glass can no longer be used as balustrades or infills in railings. The use of a tempered laminated glass is now required, so if the glass does break, it stays intact (similar to a car’s windshield). Although in effect, code enforcement has been marginal and a lot of monolithic tempered railings are still being installed despite all we know and have experienced. Tempered laminated railings are significantly more expensive and have longer lead times than monolithic tempered glass railings. Here at Suburban Glass, we feel safety is at the pinnacle of importance and will only install tempered laminated glass railing systems. As consumers, it is important to know what you are buying and how it can dramatically affect your lives.